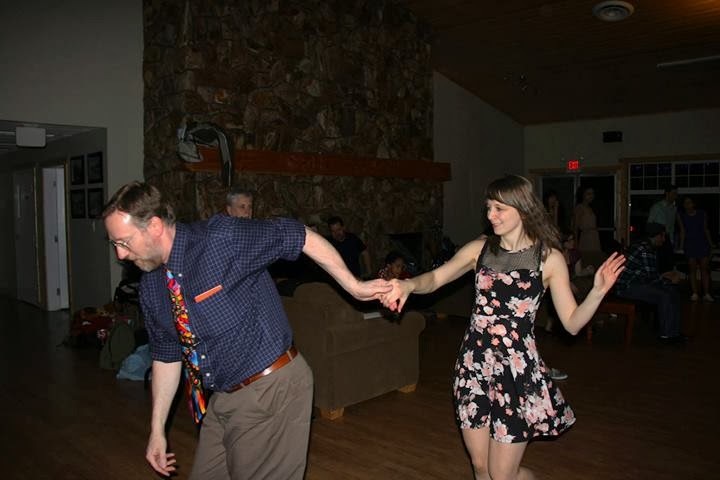 This was the first dance retreat I've attended, and I had a really great time! What I discovered first was that the facilities here at Sunshine Valley RV Resort were well beyond my expectations. The dance hall was large, with comfortable places to sit and visit for those few moments when we weren’t dancing. The cabins were truly outstanding - pine paneling, log frame furnishings and comfortable beds, along with fully equipped kitchens. One could hardly ask for more - except perhaps a snow shovel for each cabin. The driveways and parking areas for the cabins were kept well plowed though, which was good, as we were blessed with another foot of snow on Saturday and Sunday. The people who run this resort obviously strive for excellence and they treat their guests very well. Adjoining the dance hall was a warm swimming pool and two hot tubs, which were each maintained at different temperatures so you could take your choice. We had much fun playing competitive games of volleyball in the pool. Suburban Swing operators Jason & Crystal Warner provided snacks for us dancers: mixed chips, burritos, pizza and some fantastic Monster Energy Drink that I now find myself craving. They also treated each cabin with two bottles of their own specially vinted Swing Dance Wine and a box of chocolate covered cookies – very classy! The dance music was, as always, excellent, with D.J. Jose working his ever-rhythmical magic. I recognized intermediate and advanced dancers from several other clubs. In addition to those from Suburban Swing, there were dancers from WWU Swing Kids, Fairhaven Blues, Royal City Swing, Blues Bellingham and Hometown Swing. The classes were great, and the instructors did a really god job of guiding us through the new moves. It was also easy to learn because we were practicing with intermediate and advanced dancers. Judging from the relaxed moods and the frequent smiles on the faces of the dancers, I think we all had a really good time at this retreat. Jason & Crystal & Crew did a great job setting this all up and ensuring that it all ran so smoothly. They really know how to run a dance club, and as our experience this weekend indicates, they do an outstanding job at dance retreats as well. Suburban Swing - The more you dance with them, the more you love them. Enjoying the deep snow around the resort on snowshoes Friday morning and Saturday afternoon. Being surprised by my wife and two youngest kids, who showed up with a birthday cake and balloons Friday night, and being danced with by so many good friends during the birthday dance. Enjoying all the fun, laughter and camaraderie with my cabin mates: Martin Jonker, Christopher Plumber, Jimmy Stewart, Deb & Diann, Jim & Betty and Chris Christiansen. We also enjoyed each others' cooking. Martin’s Indonesian Nasi Goreng was really good, and so was Betty’s chocolate granola and cookies and her hamburger pasta/casserole. And yes, they actually liked my Beans of Paradise dish and my Oatmeal Ala-mode! Jim & Betty brought bouquets of tulips for each room and the kitchen table – I brought one home to Hilda, she really likes it. Enjoying warm and friendly spiritual discussions with the multiple brands of fellow Christians in our cabin. Learning new moves for dances I already know and learning entirely new dances like Balboa, Shag and Double Bug. Successfully performing the Judo Flip maneuver in Kamron Sammon’s Lindy Aerials Class. Having the opportunity to enjoy my favorite dance, West Coast Swing, both at the retreat and at Suburban Swing later Sunday night. Dancing a fast Lindy hop to the Monkeys' hit single “I’m a Believer.” with one of Suburban Swing's most advanced follows. Having the opportunity to ask questions of the panel of dance instructors Saturday night - a richly informative experience for all of us. Being invited in for dinner by people in other cabins as I trudged past in the snow. Catching a ride from the retreat to Abbotsford in the snow with my good friend D. J. Jose and enjoying each others' stories along the way. Feasting on a fantastic dinner Sunday night at Martin Jonker’s place together with D.J. Jose and some of our other cabin mates. Seeing so many of my fellow Whatcom Swing and WWU Swing Kids dancers at Suburban Swing Sunday night. Being treated to a second birthday dance at Suburban Swing and being accosted by mischievous pairs of double bugging follows. I can’t wait for my next dance club retreat! PS. We would love to hear about your favorite experiences at this retreat. Feel free to share them in the comments box below.